Disk images has been a popular way for sharing operating systems, enterprise software applications and games. For example, all windows operating system in MSDN and the Ubuntu operating system can be downloaded in .iso format. Other popular format for disk images are .nrg, .udf, .bin, .dvd and .ccd. So what do you do with these so called disk images with file extensions .iso, .nrg, .udf, .bin, .dvd, .ccd? Most people will simply burn it to a CD/DVD but that’s not the only way of doing it. I don’t know about you. But I hate burning CD/DVD. Unless ABSOLUTELY necessary, burning CD/DVD produces a disk which is often just going to be used for – once. So here’s how you can load your disk images without even burning one. 1. Get a copy of Slysoft Virtual CloneDrive. It’s the best and easiest to use that I’ve used so far. Daemon Tools and Alcohol 120% are 2 alternatives, but probably more useful for advanced users. 2. Install and select all supported disk image formats. 3. Select OK/Agree if being prompted to allow the installation of a driver. The driver is needed to emulate virtual drives when CD/DVD(s) are loaded. 4. Now, when the installation finished, go and look for a .iso file which we’ll be testing. 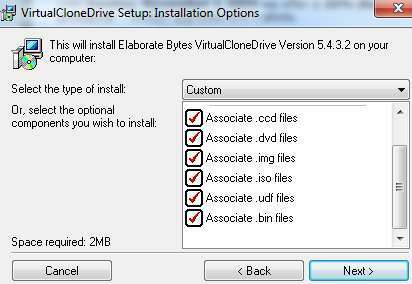 Right click on the .iso file and you should see context menu to “Mount Files with Virtual CloneDrive”. 5. Once an image has been mounted (step 4), you can go to My Computer and you should see there’s now a new drive which contains the content of the .iso file. This method works great for me. In fact, I’ve upgraded windows vista to windows 7 in-place using this method by just mounting the windows 7 iso disk image while I was in windows vista.